South African a cappella group for hire. South African Zulu Male Choir was formed from a core of artists who came to Britian in 1976 as part of the music and dance troupe Ipi Tombi. The tradition of unaccompanied harmony singing originated in the mines of Southern Africa, and is now known throughout the world due to the popularity of Ladysmith Black Mambazo. South African a cappella group South African Zulu Male Choir was formed from a core of artists who came to Britian in 1976 as part of the music and dance troupe Ipi Tombi. The tradition of unaccompanied harmony singing originated in the mines of Southern Africa, and is now known throughout the world due to the popularity of Ladysmith Black Mambazo. South African Zulu Male Choir is an all-male harmony choir whose members are all originally from South Africa. South African Zulu Male Choir’s repertoire is called Imbube and Isicathamiya and is sung most prominently in Zulu. This art form originated from the migrant peoples from poor Southern African states who indulged in singing and dancing to while away the monotonous time in the gold mine compounds around Johannesburg where they worked away from their homes and womenfolk. As a result, during the 1920’s choirs such as ‘Crocodile’ and ‘The Durban Evening Birds’ were founded. These choirs’ influence spread like wild fire throughout all Southern African countries where there are communities with Zulu historical origins and connections. The modern style of Imbube and Isicathamiya’s lyrics are about war, suffering, famine, love, happiness and Christianity. Few groups have perfected this form of music and been promoted as much as Ladysmith Black Mambazo. 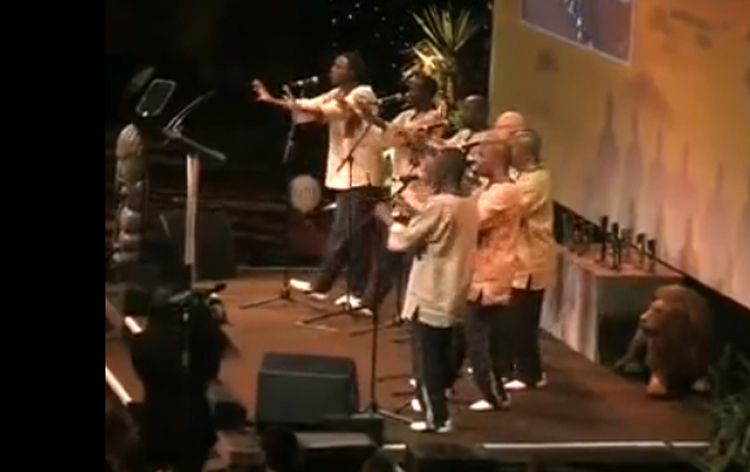 However, South African Zulu Male Choir are also a force to reckon with – good to watch and brilliant to listen to. They have toured throughout the UK, Europe and internationally, appearing at many high profile events including singing in Wembley Stadium at the release celebrations for, and in front of, Nelson Mandela.